‘Nothing is certain but death and taxes.’ So said American founding father, Benjamin Franklin. His politician’s soundbite still echoes through the centuries, but it omits another certainty: the movements of the planets. Astronomers can say, with confidence precisely where Venus or Mars will be this time next week or even on a given date in 3009. That’s why, for those who seek to foresee the future, the sky is so fascinating. Not everything up there, though, is predictable. Comets for example, can surprise everyone. 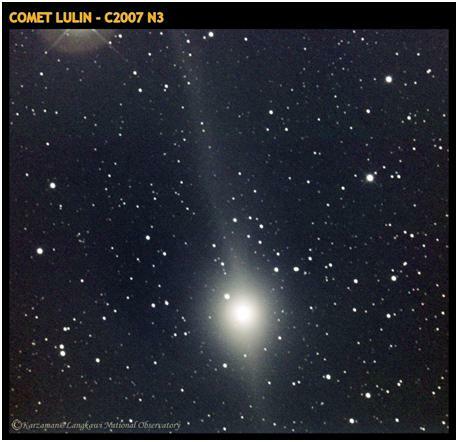 With each day, it looks more likely that Comet Lulin will soon surprise us all. Ah, the movements of the Spheres – Aristotle would be so proud. Us, dull sublunary lovers, bound to change and decay can only gaze wistfully at the perfection in motion of the heavenlies. At least we could, until Kepler worked out that the Planets were dancing around in a kind-of Oval shape. It turns out that the level of determination/certainty in the movements of the planets is precisely the same for that of any physical object. Not more or Less. ‘All things bright and beautiful…’ So goes the popular old hymn. But of course, that’s not all the Good Lord (or Lady) made. The Devil, we are reliably informed by the good book, is a fallen angel. So who made him (or her)? It is all, we are told by those who consider themselves entitled to interpret such things, to do with ‘free will’. We all have it, but we don’t all use it. Currently, you feel as if you have a serious lack of choice. Whatever put you in this position, has also put, within your reach, an opportunity to get out of it. 1. We either have Free Will, which would make telling the future from Celestial Bodies (other than my wife) seem like a deeply, wildly, and breathtakingly fraudulent activity. Hey, maybe they just, kind of, like, going around in not-quite circles… who knows? If we assume that the Planets don’t have free will, and neither do we, then it is still possible that there is a cause-effect relation between Planetary Behaviour and our own, but what direction does the relation flow? 3. Whatever weird and twisted cosmology could be formulated to prop up this chicanery, surely it gets grievously disturbed by the arrival of a UNEXPECTED COMET. To be fair, Comets really messed up Aristotle as well. A practice that pretends to predict the portentous from the regular motions of heavenly bodies takes a fair knock on the head when something shows up out-of-the-blue/black, and not only that, is heading in the wrong direction. I love you Comet Lulin – you gloriously shiny, silver, turkey bullet. after all, when I was your age Pluto was still a planet.